Now this is more like it! So far I haven’t been too impressed with this six tele-movie Saint series. 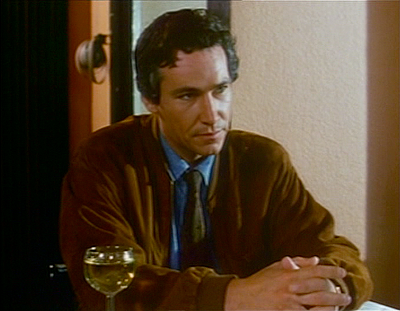 I liked The Brazilian Connection for the rapport between The Saint (Simon Dutton) and Inspector Teal (David Ryall), but the others have been pretty limp. However, Wrong Number is a good one and it is a legitimate spy story to boot. 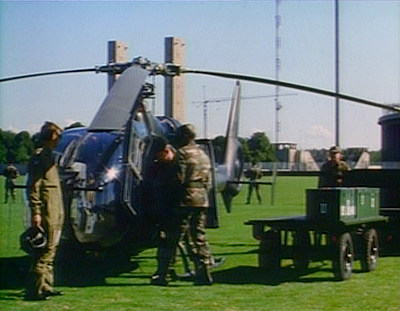 This episode is set in Berlin in the summer of 1989, just months before the Berlin Wall came down. And in that way, this show is a fascinating time capsule. There is still East and West Berlin, and a small amount of Cold War tension, but really you can tell the stern opposition between the two sides has thawed. Although the ‘wall’ is a prominent part of the story — it acts more as a landmark than a barrier. In fact, there seems to be very little difficulty for Simon Templar to travel from East to West. 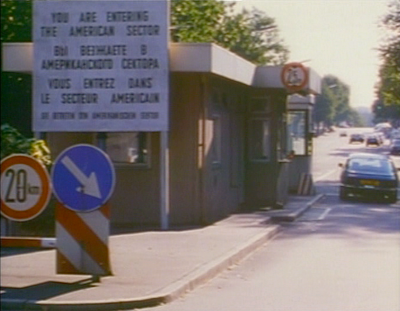 In fact, that’s how the episode begins, with Templar crossing at a check-point into the American sector. From there he drives to the Hotel Intercontinental and checks into his usual suite – room 432. Before Templar has even had a chance to unpack the phone rings. The voice on the other end says, ‘You’re blown. Meet me at Conrads,’ and then rings off. Templar is confused and rings down to reception to enquire about the call. The reception girl says that there was no call for him but a call for room 423 — she obviously put the call through to the wrong room. Templar’s not the type to sit on his hands and he immediately goes to investigate room 423. When he gets there, he finds the door ajar, and the occupant of the room — a Mr. Anton — dead in his bath tub. Templar immediately calls the police. Templar can’t just leave it at that though. He has to dig deeper and makes his ways to Conrads, which just happens to be a coffee-shop / bar. There he sits, watching and waiting. When Templar begins puffing on a very distinctive white pipe, which happened to belong to Mr. Anton, and which Templar discretely removed from the hotel room, one of the patrons becomes visibly agitated and leaves the coffee shop. Templar follows and a good thing too, as two goons are waiting outside for the contact. They open fire. Templar steers the contact into his car and races off. The goons follow in hot pursuit. Soon, the two cars racing through the streets of Berlin catch the attention of the local police and they too join the pursuit. The car chase grinds to a halt in a dead-end street. The goons crash and the driver is killed. The second goon manages to escape. Meanwhile the police have Templar and his contact bailed up — that is until the contact, Otto Schmidt (Günther Maria Halmer) reveals himself to be an operative for an organisation called A.T.L.A.S. — which stands for Anti-Terrorism Liaison Agency Service. The police release them. Herr Schmidt takes Templar to meet the heads of A.T.L.A.S., where he is recruited — or more correctly offers to assist them in their investigations. It appears that a known terrorist Peter Lang is at work in the area and he is in the midst of a major arms deal. 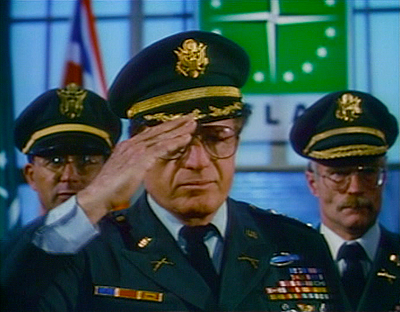 Co-incidentally at this time, US General Donovan (Vince Edwards) is innitiating a program whereby US nuclear warheads are transported from West Berlin back to the United States for decommissioning. 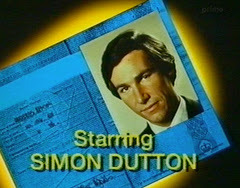 Of course I can’t really know how Simon Dutton felt about his stint as the Saint, but to my mind, he was in someways better off than some of the previous actors who played the character. 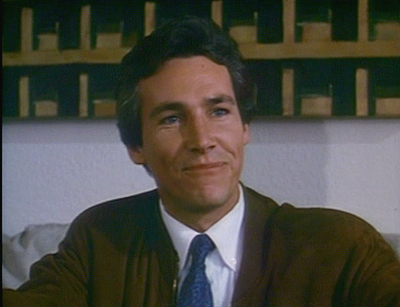 Rather than being studio bound, Dutton got to travel all over the world to make this series — France for The Blue Dulac, Australia for Fear in Fun Park and Germany for this installment, Wrong Number. But by the same token, Dutton didn’t have the safety net of a Saintly seasoned and consistent crew working on each of the movies. Each country seemed to supply its own director, crew and supporting actors, which means the series is wildly uneven. But as I mentioned at the top, this is a good entry in the series — possibly the best, and Dutton gives another likable performance. Spy-spotters may recognise Vince Edwards as General Donovan. In the sixties, Edwards played super-agent Charles Hood in the polished but disappointing Hammerhead, based on the novel by James Mayo. If I had to recommend just one of the Simon Dutton Saint series, this would be the one, and that is not just because it has a rather heavy espionage based plot. 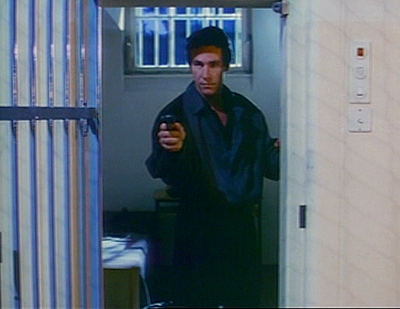 Wrong Number has the best story and best acting out of the six episodes as well, which makes it a clear winner. It is also interesting watching the last throes of the Cold War play out in their actual locations. • Fear in Fun Park.